We're in a book, Ace and I...well, mostly Ace. 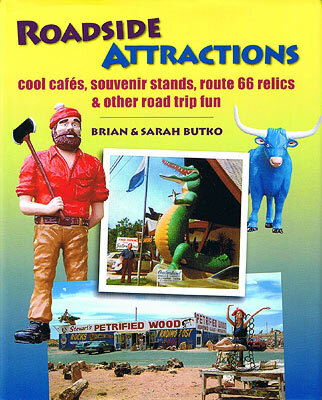 With Roadside Attractions: Cool Cafés, Souvenir Stands, Route 66 Relics, & Other Road Trip Fun , experienced travel authors Brian and Sarah Butko have created the book that I hope and believe will mainstream them into book stores from... I started to say "sea to shining sea." But "from Astroland to Gatorama and the Madonna Inn to the Oregon Vortex" would be more appropriate. I estimate the book contains information on roughly 350 off-beat meccas for those of us to whom the term "tourist trap" carries no negative connotation. And it is of tourist traps I often dream...and so do you, I bet. Some books are good mostly for dreaming as the wonders they portray are largely gone. Sven Kirsten's The Book Of Tiki and Alan Hess' Googie Redux: Ultramodern Roadside Architecture fall into that category as they instill wanderlust for meccas that are largely lost to us. It is a special brand of sweetest longing. Increasingly, since it hasn't been updated since 1992, the venerable (and much beloved) New Roadside America inches into this category as more of its attractions disappear. This has been noted in a very insightful review over at Route 66 News. And this brings me to what I call the "wishbook factor" - the degree to which reading a travel book reminds me of perusing the Sears Christmas Catalog "Wishbooks" when I was a kid. We had quite a few Sears Wishbooks from previous years back then, and my friends and I would pine for that Marx playset or G.I. Joe space capsule no longer manufactured. Great subculture books, be they about travel, tiki, googie or toys, have a high wishbook factor. You really luck out as a reader when a travel book with such a high factor happens to be about stuff we can still see. And that's what the Butko's have delivered with Roadside Attractions . With the exception of some places mentioned in "fan favorite" sidebars, the stuff is still there. Scattered through the book are sidebars written by various travel and roadside architecture authors and such. What karmic pay-off placed us in their company, I'll never know. Ace's sidebar is on page 112. 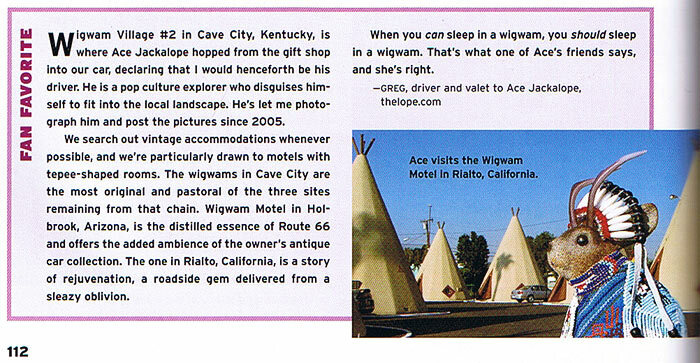 The picture is from our visit to the Wigwam Motel in Rialto, California. The friend quoted is Patsy Terrell. Doug Kirby, Ken Smith and Mike Wilkins, authors of New Roadside America and editors of roadsideamerica.com, write about Bayou Bob's Rattlesnake Ranch. The name kind of says it all. Alan Hess, author of Googie Redux: Ultramodern Roadside Architecture , learned that "architecture was much more than a physical structure" from giant oranges. Photographer John Margolies and writer Maria Reidelbach are two-thirds of the team that put together one of my favorite wish books, Miniature Golf . It's the only book I have that is bound with AstroTurf. Margolies admires the "best darned trained bear show" of New Hampshire's Clark's Trading Post. Reidelbach instills hunger for Homestead, Florida's Fruit and Spice Park, where you can "nosh your way through" treats offered by 500 varieties of plants. 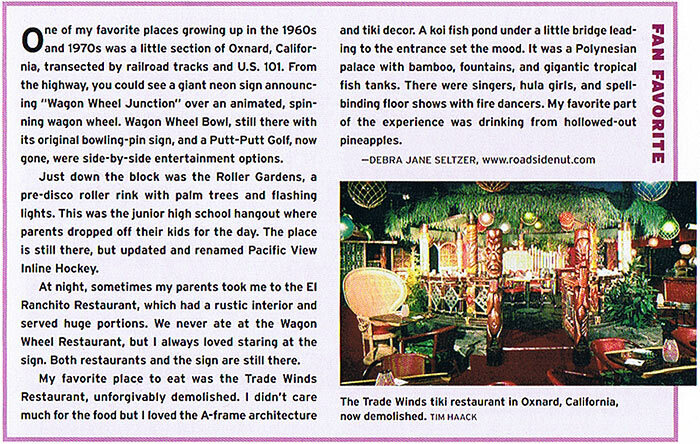 agilitynut.com webmaster Debra Jane Seltzer, with whom I enjoy trading notes on fiberglass and sputniky wonders, laments for the "unforgivably demolished" Trade Winds Restaurant of Oxnard, California - a tiki attraction. On a more Earthly plane, three of the commentators are folks I met this summer at the National Route 66 Festival. Jerry McClanahan, author of Route 66: EZ66 Guide for Travelers , shares his family's quasi-mythological "Lost Snake Pit." Jim Ross, author of Oklahoma Route 66 , walks us through family memories of a dude ranch near Jackson Hole, Wyoming. Shellee Graham, author of Tales From the Coral Court: Photos & Stories from a Lost Route 66 Landmark remembers a treasured tourist trap tomahawk from a childhood trip to Ogallala, Nebraska. The book is well indexed and contains a list of applicable websites and other contact information in back. Speaking of which, we need to get back to reading and planning trips. Touristic Nirvanas don't photograph themselves, you know. 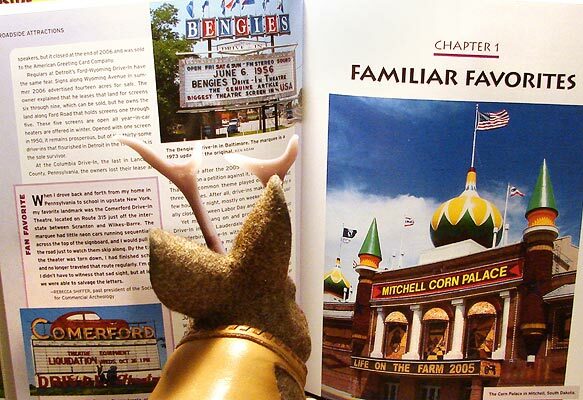 Ace Jackalope wonders how much butter he'll need for the Corn Palace. I just bought the book and am looking forward to reading it. Nice to see that Ace was included. Your blog is brilliant and Ace is ace. Woo Hoo!!!! Congrats Ace! I will have to get this book! I have many RA books as well as Weird NY and Indiana Curiosities! Yay!